Eight to four this weekend, simple maths but the likelihood I predict all four NFL Divisional Playoff games correctly is the same as me solving a Rubix Cube in 3.98 seconds. This weekend is the equivalent of a Shakespeare Festival, full of comedy and tragedy, different acts, highlights and lowlights, but above all chock-a-block with awe-inspiring drama. On the surface the eight remaining teams cannot look beyond this weekend, but the likes of Tom Brady, Aaron Rodgers and Ray Lewis will be thinking two more wins and we are back in the final, the big dance, the Super Bowl. Fact #1 – the last time the New England Patriots won a Super Bowl was eight years ago. It doesn’t sound right but it is fact. For all their dominance the last time they picked up a Vince Lombardi Trophy was against Donovan McNabb’s Philadelphia Eagles in 2005. Fact #2 the Houston Texans have never played in a conference championship. The time is right for the Texans to cause a major upset in New England and this time around the Texans have a veteran starting quarterback and a fit number one wideout in Andre Johnson. The Pats have done what they always d0 – blow out the water about half the teams they play. They have also lost to the Cardinals, barely topped the Jaguars and were beaten by two current NFC playoff teams (49ers and Seahawks). JJ Watt the Texans defensive end has been playing like a man possessed all season long, and will be after Tom Brady all day long. This game will come down to the team that can best run the ball. Both teams have quality passing games and lots of targets, but without a running game, any of the play action will be ineffective. Tight-ends will play a big part in this game, and I would not be surprised to see three tight-ends score Sunday (Hernandez, Gronkowski and Owen Daniels). Texans to win 31-28 on a come-from-behind Arian Foster rushing touchdown. Fact #1 If I had a £1 for every column inch written about Peyton Manning’s neck I would have enough to buy one expensive scarf. Fact #2 this could be the last professional football game that Ray Lewis ever plays in. There is a distinctly eerie feeling that we could see a Manning Brothers consecutive Super Bowl win streak like we did in 2007-2008. Peyton has been Peyton all season – leading the Broncos from the front with accurate swift passing and a low number of turnovers. The Ravens are riding on the emotional wave that is Ray Lewis and his peacock display dance. Baltimore’s team has itself been peacock like, spending most of the season quietly winning where it needed to and then on occasion making big noise. Thing is a peacock is not a bird of prey, it uses its feathers to make a grand gesture that ultimately flatters to deceive. Too many times I have seen Ray Lewis amped up at the start of a big game only for his rallying cry magic to last about a quarter of football. Second chances may be the theme for this game, but the team to take home the bacon will be Denver. Knowshon Moreno has taken his second chance by the horns and will have a big game pounding the rock in between Manning dismantling a Baltimore secondary that simply is not a stud unit (Ed Reed is of course a legend but he cannot defend an offense on his own). Broncos to win 33-19 on the back of Manning throwing three touchdowns. We have a Super Bowl winning quarterback against a second year passer, who for all concerned is playing in his first real NFL season. Green Bay’s Aaron Rodgers has already got a ring. San Francisco’s Colin Kaepernick has never played in the NFL playoffs before. This game is a case of momentum, and that belongs to the team from Wisconsin. The Packers have all of their wide receivers fit (Jennings, Jones, Nelson and Cobb) and even their tight-end Jermichael Finley is coming up with big plays after a sub-par regular season. The Niners can run the ball and play solid football behind the ever-reliable Frank Gore, and in the last few weeks we have seen glimpses of the rookie tailback LaMichael James who can return kicks and be a spark on offense. 49ers defense will play hard but without a fully fit defensive tackle Justin Smith the team will not be able to cope with a razor-sharp Aaron Rodgers. I expect this to be low scoring, and to some extent a scrappy game. Packers 24-19 with James Jones getting two touchdown catches and Randall Cobb tormenting the Niners linebackers all game. The Atlanta Falcons finished the regular season with the best record in the NFC, and have had a week to rest weary limbs, but due to their disappointing playoff pedigree in recent years they are listed as the upset special by many prediction prognosticators. The Seahawks are already playoff winners this season, but they fought against a Redskins team that had an injured quarterback and a very average defense. Atlanta have the rather huge monkey, well gorilla, to shake off their backs that equates to the fact their future Hall of Fame tight-end Tony Gonzales has never won a playoff game in his illustrious NFL playing career. It’s one of those statistics that seems completely bonkers, but is true. It is also a statistic I believe that will finally vanish on Sunday afternoon. The Falcons know what they have in front of them, a possible two home wins leading to a Super Bowl appearance. Big ol’ Michael Turner has slowed to a crawl but he still manages to collect six point bonuses (10 this season). Roddy White and Julio Jones will be the difference in this game as they may be able to be man marked if one is on the field, but having both on the field has been near enough impossible to stop, even for the hulk like cornerbacks in Seattle. It will take a superhero effort from Matt Ryan and a relatively low-key Falcons defense but it will be possible. Falcons to win 30-20 with Matt Bryant kicking three field goals – all when the mattered. 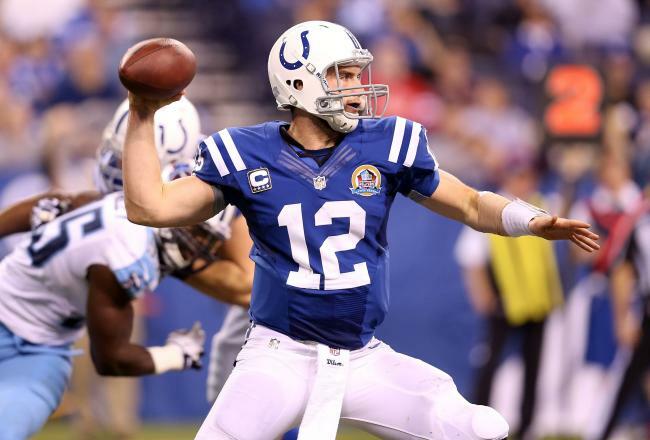 NFL FAN IN ENGLAND Wild Card predictions – Nothing to do with ‘Luck’! Wild Card weekend is akin to being let loose in a Belgian chocolate factory. You get to taste the quality (8 of the NFL’s top 12 teams)and get to gorge (on four NFL games over two-days) but the bonus ball is that you don’t count the calories. That’s not strictly true as I can pretty much guarantee that any NFL fan watching all 240 minutes of live playoff football will likely dine out on pizza and crisps and a few litres of suds. All four games this weekend have great story lines from what maybe Ray Lewis’s final NFL contest against a coach who has fought Leukemia to two of the most efficient rookie quarterbacks in NFL history facing each other in a venue that has not hosted a playoff game for 13 seasons. Let me get straight into it and offer my predictions – with a soupson of insight. The Texans sure know how to walk backwards dragging their bruised and battered limbs into the playoffs, having suffered a late regular season collapse, and instead of having a week off, have to face a very respectable Bengals team that have quietly returned to the post-season for a second consecutive year. Arian Foster will want to impress in what is Matt Schaub’s first ever playoff game. Talk is that the Bengals defense has done a very good job, but this game will come down to Houston’s defense shining on a national stage. 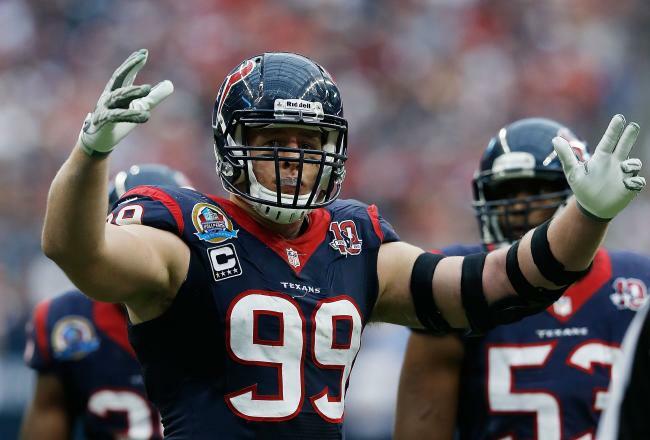 J.J. Watt is an absolute beast and will get a couple of sacks and a forced fumble. Weird one as the teams only met last week in Minny, with Adrian Petersen running so hard the Packers wished they had gone to a three-day New Year party starting on 29 December. I absolutely loved it when Packers WR Greg Jennings was asked this week if he enjoyed playing at Freezing Lambeau Field and he said that he would rather play in a dome – at last someone who is honest. This game will be heavily influenced by the fact it will be played in Green Bay, that and Aaron Rodgers will be hellbent on making a playoff run after last season’s debacle. Keys here will be Packs ability to establish a running game and Vikings quarterback Christian Ponder’s ability to stay upright. I say this gets ugly as AP fails to establish himself and is held under 100 yards rushing. Forget all the emotional crap about Ray Lewis coming back from an injury to inspire the Ravens to a playoff run. This is not the time for a Ravens revival. People have forgotten how devastating the loss of cornerback Lardarius Webb was earlier in the season. The Colts have defied all the odds, going from 2-14 to 11-5. Andrew Luck (see pic) has slotted into the Indy QB position like a seasoned veteran, and done what other great quarterback have done – performed alchemy to turn the rest of the team from base metal into gold. An old Reggie Wayne and a young T.Y Hilton should not be enough to get a team 11 wins, but that is why the guy went #1 in the draft in 2012. Look for the Ravens to hold a lead for the majority of the game only for Luck to get the winning td or final drive that leads to the sealing field goal. Having stayed up until 4.30am on Monday morning and then being in work for 9.00am I can say that I made a small sacrifice (missed sleep) in order to will the Redskins to their seventh consecutive victory. The sacrifice made by Alfred Morris the Washington Redskins outstanding rookie running back was far greater as he ground out a whopping 200 yards rushing to help his team win their division for the first time this century. The reward for such a heroic performance is a home playoff game, the first since 1999, against a talented Seattle Seahawks team. This is only the second time I think that two rookie quarterbacks have met in the playoffs as Robert Griffin III, the Heisman Trophy winner in 2010 goes head to head with Seattle’s young stud Russell Wilson. I predicted Wilson to be the offensive rookie of the year, and whilst he will probably lose out to Griffin III he has had a spectacular season that has to be recognised. The Seahawks went 8-0 at home, something that teams with such a fervent home support should achieve, but rarely do. The Redskins traded the whole farm to get RGIII at pick #2 in the 2012 draft, and despite my reluctance to not get too excited, having watched years of tepid quarterbacking in Washington, this is one man who has lived up to the hype from the moment the season started. RGIII has run and passed his way to 10 wins in 16 games, not a record Redskins fans are familiar with. His best skill has not been his lightning runs or bullet passes, in my eyes it has been his absolute wizardry with the ball before it is passed, like David Blaine on crack, constantly confusing opponents as he hides the pigskin up his sleeve before breaking for a run, delivering an accurate play action pass or directing Alfred Morris to another 10+ yard gain. RGIII has also done the one thing that sets him apart from any Redskins quarterback in the last decade by avoiding turnovers. Two lost fumbles and five interceptions in 15 games as a rookie is simply not normal. I can recall rookie quarterbacks committing that many turnovers in a game or two. Seattle have Marshawn ‘Beast Mode’ Lynch, at lead running back, who managed 1,590 yards rushing, third best in the NFL this season. Problem is that the team he plays against on Sunday possesses the second best rusher in the league, as Alfred Morris will be fired up and ready to rock. The ‘Hawks offensive line has two Pro Bowl starters in tackle Russel Okung and center Max Unger, whereas the Redskins have one second string Pro Bowler in the form of tackle Trent Williams. In my opinion the Redskins center Will Montgomery should have got a Pro Bowl shout himself, as he has been a very steady and calming influence on a team that did no more than simply lead the entire NFL in team rushing. The Seahawks and Redskins are similar in that their least glamorous part of their offenses is their receiving corps. Washington’s top two Pierre Garcon and Santana Moss barely set a 12 pack of birthday candles alight and the Seahawks Sidney Rice and Golden Tate have been average if I was to stretch it. Neither team has had an outstanding tight end performance this season, but both team’s gameplans have meant this position has been more about complex blocking assignments than 40 yard fly patterns. On the defensive side the Seahawks have a far superior unit, but for some strange reason the Redskins 7 game winning streak has a lot to do with the Washington defense stepping up and delivering killer turnovers. When Redskins linebacker Rob Jackson intercepted Cowboys quarterback Tony Romo with three minutes left, and the team only up by three points, there was a collective exhaling of breath by the home fans that was enough to register as an A grade tropical storm on the Weather Channel’s wind monitoring device. This game will not be decided by kickers, or by two of the best running teams in the league, this game will come down to one simple fact – whoever commits the fewest turnovers will win the game. RGIII and Russell Wilson are not your typical rookie fumble-fest turnover machines. They are both coached extremely well and will be determined to show a global audience that they can move on to the next round of the dance. I just think that home-field advantage will be enough to lift the Redskins to a narrow victory. The Seahawks are 3-5 in games away from the artificial turf and the drizzle. Not to say it won’t be raining in Landover, Maryland on Sunday night, but playing on a churned up grass surface is something that Alf and the ‘Skins are accustomed to. I’ll say Redskins 27-20 with RGIII rushing for one score and passing for another and Russell Wilson committing an uncharacteristic turnover that will cost the Seahawks a chance to progress. Look for the Seahawks defense to play hard for 60 minutes, but Coach Shanahan and his son errr Coach Shanahan to be prepared with play action passing and a run game more akin to a meeting of the magic circle than the diesel/counter gap running of the 1980s Redskins. Also look out for a furry alien at Fed Ex Field – you heard it here first – its time go up into the loft and dig out your Alf dolls. It’s Alf Sunday.